Puerto Rico is a German-style board game created by noted game designer Andreas Seyfarth, and published by Rio Grande Games. It's 1543, and Puerto Rico is beginning to blossom. You have the opportunity to become very wealthy by owning the most fruitful plantation. You must carefully decide which of seven roles to play: settler, mayor, builder, craftsman, trader, or captain. Each role allows a player to do a specific action. For example, the settler may take a quarry tile; the mayor may place a colonist; a builder can build a building for less; the craftsman gets one additional good; a trader may sell one good, and finally the captain loads his goods on to the ship to the old world first. Players can act on every turn of the game, allowing them to choose between shipping goods for points or building an impressive city. Players must manage their colonists, erect a variety of buildings, build up their plantation, and sell or ship goods. In the end, the player with the most victory points (the best plantation) wins the game. 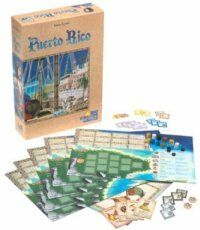 Puerto Rico is one of the most critically-acclaimed board games in recent memory, winner of the International Gamers Award for best Strategy Game and the GAMES Magazine Best Advanced Strategy Game , and continues to impress players with its brilliant mechanics and streamlined gameplay. If you've enjoyed the Settlers of Catan or Carcassonne series, you're sure to enjoy Puerto Rico as well! The vastly popular board game Puerto Rico is now available for your PC, where you can play solo or against friends online anytime, anywhere! Build your wealth and reputation in the island colony of Puerto Rico while taking on the roles of Prospector, Governor, Settler, Trader, Merchant, and Craftsman while trying to build and expand the colony itself. With control over the 3 levels of artificial intelligence and the speed of the computer turns, play can be as easy or difficult and as fast or slow as you like. For Windows computers.